Farm Girl Adventures: Tim's New Place! On Saturday, we all went over to North Wilkesboro to help Tim move into his new place. He found a very nice three bedroom two bath house. 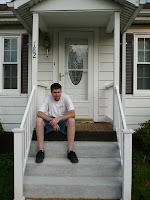 Here he is on the porch on moving day. ! He's also got a detached garage with automatic opener. At the back of the garage there is a storage/tool room. There is also a locking shed for his lawnmower. This house he has to mow his own lawn! Once we got all the furniture moved and in the new place, the guys proceeded to set up a puppy yard so it would be ready for the new pup. After all the work was done, we barbequed some chicken and sliced zuccini on the grill, threw together a salad and served it all up with some big fat yeast rolls. YUM! Shortly after that we headed home and left the rest of the mess for Tim.